Right there in the flesh, taunting me, mocking me. So here's a thread to celebrate the times we resist the temptation. Hopefully, when we look back in a year's time we'll think "I'm glad I didn't buy that crap, I'm so much happier for having saved my money for something sensible". 70 quid is a bloody ridiculous price anyway. 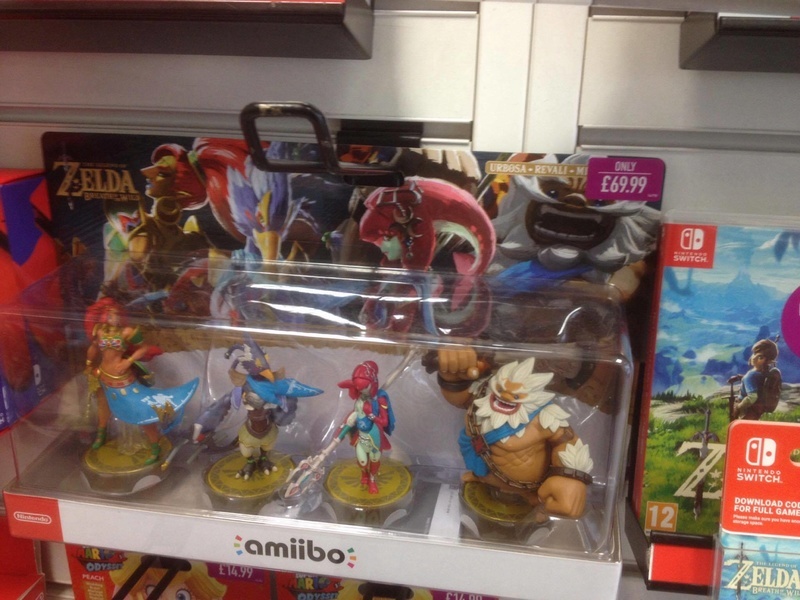 That's £20 more then what I paid from Nintendo UK Store. I see that now and again in CEX, want me to keep an eye out Mas? I've just been having the same convo about the price with some friends on facebook. Brexit, innit? Nah it's just GAME being GAME with that silly price as Nintendo UK, Amazon etc don't seem to be affected by the whole brexit with there prices. Brexit is killing the high street, was my point Mas. Amazon and Nintendo are a little better, and obviously there's more than just Brexit making people turn to online shopping. Also, was just a silly little comment mate. Possibly but GAME have been going down hill for years, and haven't really recovered from when they where in administration. Especially when you see the local game shop can charge so much less. Yeah, GAME are a shitshow. I love going into independent stores so much more. I pretty much only use them to buy a console or something exclusive now but have picked up some 360 games for £2 from them. I'm a GAME man for trade-ins. My calm, forum-dad-like exterior and personality hides a wheeler-dealer of extraordinary proportions. I may be on a train and slightly bored. I used to use them for that, then they stopped matching the independent store or CEX plus a newish game, if I beat quick enough I can just eBay and get almost what I paid but in cash. I went to GAME to get my Switch. So, er, I guess I'm still happy they're around! As for what I still haven't bought: Rocket League. Got to pick it up at some point, I know! When GAME started charging for a "demo" of PSVR*, I assumed they weren't really a shop any more. I went to my local one for the first time in a couple of years; I was surprised they'd bought the area next door, but it now seems to be largely a creche, as there's loads of gaming setups there. What a weird future we live in! Actually, that's less of an aside. Things I wouldn't buy: a demo of a VR system. I only bought two books in the store instead of the seven I could have walked out with because money, does that count? How long a demo is it? If its like an hour or half an hour, that'd sort of make sense. I'd sooner rent a VR to have a quick go and think "that was neat" than pay top dollar then let it sit in a drawer. I think them PS VR demos were 15 minute sessions for £5, or was it more? Every now and then I think about collecting all the Wrestlemania/Royal Rumble/Summerslam/Survivor Series DVDs, even if it's £10 a month (the equivalent to the Network), but then I remember I rarely ever watch DVDs these days. I go on YouTube and watch "Top 10 best wrestling returns" and I close my laptop, satisfied. Got to support the new tech if it turns out to be good (Switch) or bad (3D). Now on VR, I think it may have finally become financially more viable for more people with PSVR being around £250 (during Black Friday but January Sales again soon) with a game or two plus Sony has made some tweaks to the setup along with good content coming to the platform such as big 3rd party titles like DOOM and Skyrim. Surprised it has gone up to £25 for Double Dash. I've seen that preorder bonus (HMV did one for Wind Waker) a few times but the actual collector's edition is the one with Zelda which is £25 in CEX as well if you can find it. I popped into Game during the split in my shift today, looking to pick up the last few Switch games I'd like to have with my Switch. I took L.A Noire, Xenoblade Chronicles 2 and Skyrim and went to the counter. "Oh", says the cashier, "we only have the download codes for Xenoblade, not the physical games." I say never mind, I'll just have the other two. Then it turned out there weren't actually any Skyrims in the drawer. So I walked to the counter with three game cases and they could only sell me one game. I experienced that with Kirby: Mass Attack. The box was on the shelf, I took it to the counter, the guy there said "We have to keep the boxes out to keep Nintendo happy", I boggled. I don't even work in GAME and I can tell you the cases are left so you go to the till like Drunka did, they go we've not got Skyrim in stock but would you like me to order it, with Drunka going Nah I'm fine mate. Aght. How irritating! Hope you can pick 'em both up soon. GAME is daft sometimes. Should say I've mostly had good experiences with 'em.